Smooth plastered ceiling and walls all painted in neutral colours, inset LED lighting, television aerial point, radiator, various power points, neutral coloured carpet, open aspect to Family Room. Great Open Plan Room leading to Lounge and Kitchen. Two sets of white UPVC double glazed sliding patio doors and white UPVC double glazed window to Rear Garden, smooth plastered ceiling and walls all painted in neutral colours, inset LED lighting, radiator, neutral coloured carpet, open squared arch to Fitted Kitchen. Door from hallway, smooth plastered ceiling and walls all painted in neutral colours, inset LED lighting, range of modern fitted units at both base and eye level with feature worktops and tiled splashbacks in neutral coloured ceramics, array of drawer units with brushed steel fitments. Integrated appliances include eye-level stainless steel / glass “Bosch” combination microwave / oven and grill with matching fan-assisted oven below, black four ring “Bosch” hob, built-in wine cooler / fridge with transparent door, space for upright fridge / freezer, space for washer / dryer and dishwasher, stainless steel sink unit with mixer tap, wall-mounted television point, various power points plus retractable power tower inset to worksurface, wood effect tiled flooring. White double glazed window to front aspect, smooth plastered ceiling and walls all painted in neutral colours, inset lighting, built in wardrobes providing hanging and shelving space, radiator, television aerial point, various power points. Neutral coloured flooring. White double glazed window to front aspect, smooth plastered ceiling and walls all painted in neutral colours, inset lighting, recessed space for wardrobes, radiator, television aerial point, various power points. Neutral coloured flooring. White double glazed window to side, smooth plastered ceiling with inset lighting, part plastered and part tiled walls in neutral coloured ceramics with feature decorative vertical border tile and inset shelving. Modern suite comprises: Dual flush low level wc, wash hand basin with chrome mixer tap and fitted cabinet below, P Shaped bath with chrome mixer tap and Rainfall shower above with separate flexible hose and glazed chrome trimmed courtesy panel, antique style heated chrome towel / radiator. Complementing floor tiles. Fantastic fitted “Infinity Mirror”. White UPVC double glazed window to side, smooth plastered ceiling and walls all painted in neutral colours, inset LED lighting, neutral coloured carpet, radiator, various power points, doors to bedrooms. Full-size walk-in Dressing Room with smooth plastered ceiling and walls, inset LED lighting, neutral coloured carpet. 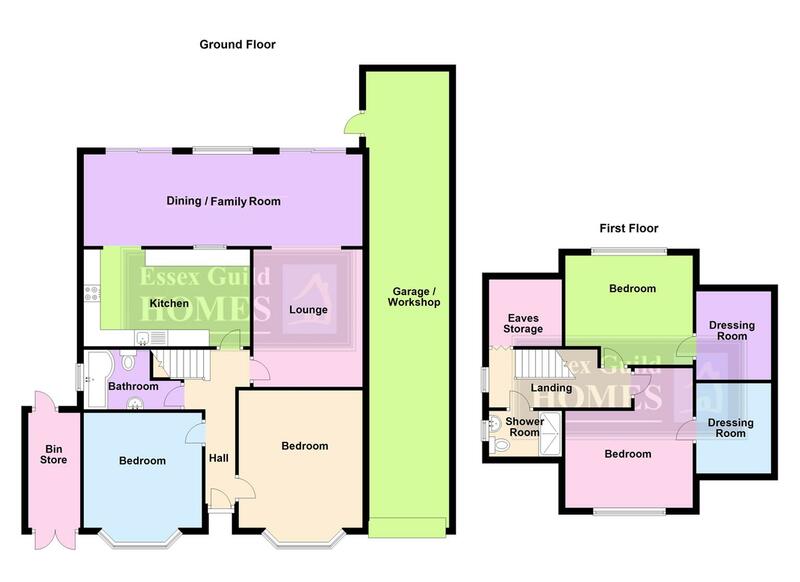 Large white double glazed window to rear, smooth plastered ceiling and walls all painted in neutral colours, inset LED lighting, neutral coloured carpet, radiator, television aerial point, various power points, door to Dressing Room. White double glazed window to side, pitched smooth plastered ceiling with inset lights, smooth plastered walls all painted in neutral colours, three piece fitted suite comprises: wash hand basin with chrome mixer tap and fitted cabinet below, wc with concealed cistern and shelf above, tiled shower cubicle with feature decorative mosaic border tile, rainfall shower with flexible hose attachment, glazed entry door and matching side panel, tiled flooring, radiator. Double opening grey painted doors to front, door and window to rear, power and lighting connected, wireless alarm system, Garage could be divided into rooms / sections with ease if required. Commences narrow stone patio area extending to sides, central path to rear, pathway to decked area in far corner, mostly laid-to lawn with established raised beds with various matured shrubs and bushes, feature outside lighting, storage shed attached to rear of Garage, pathway to side of property leads to further attached storage room with power and lighting. We note from the seller that there is a pumped pressured water system in the garden with outside tap. Hardstanding allowing parking for multiple vehicles, feature outside lighting.